According to Srimad Bhagavatam (12.3.51), “kirtanad eva krishnasya”, simply by chanting of the holy name of Krishna, one is liberated and returns home, back to Godhead. Therefore one must adopt the chanting of the holy name as the principal method of advancing in spiritual life. 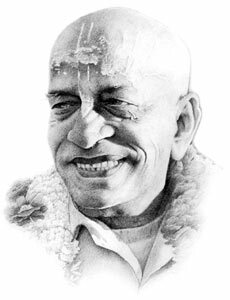 Krishna consciousness is not an artificial imposition on the mind. This consciousness is the original, natural energy of the living entity. When we hear this transcendental vibration, this consciousness is revived. This simplest method of meditation is recommended for this age. In the material concept of life we are busy in the matter of eating, sleeping, mating and defending, as if we were in the lower, animal stage. A little elevated from this bodily concept of life one is engaged in mental speculation for the purpose of getting out of the material clutches. A little elevated from this speculative status, when one is intelligent enough, one tries to find out the supreme cause of all causes, within and without. And when one is factually on the plane of spiritual understanding, surpassing the stages of sense, mind, and intelligence, he is then on the transcendental plane. This chanting of the Hare Krishna Maha Mantra is enacted from the spiritual platform, and thus this sound vibration surpasses all lower strata of consciousness-namely sensual, mental and intellectual. There is no need, therefore, to understand the language of the mantra, nor is there any need for mental speculation, nor any intellectual adjustment for chanting this Maha Mantra; also anyone can take part in the chanting without any previous qualification. Chanting reestablishes our lost connection with God and takes one immediately to spiritual platform. The word Hara is the form of addressing the energy of the Lord, and the words Krishna and Rama are forms of addressing the Lord Himself. Both Krishna and Rama mean “the supreme pleasure”, and Hara is the supreme pleasure energy of the Lord, changed to Hare in the Vocative. The supreme pleasure energy of the Lord helps us to reach the Lord. The material energy, called maya, is also one of the multi-energies of the Lord. And we, the living entities, are the marginal energy of the Lord. The living entities are described as superior to material energy. When the superior energy is in contact with inferior energy, an incompatible situation arises; but when the superior marginal energy is in contact with the superior energy, Hara, it is established in its happy, normal condition. These three words, namely Hare, Krishna, and Rama, are the transcendental seeds of maha-mantra. The chanting is a spiritual call for the Lord and His energy, to give protection to conditioned soul. The chanting is exactly like the genuine cry of a child for its mother’s presence. Mother Hara helps the devotee achieve the Lord Father’s grace, and the Lord reveals Himself to the devotee who chants this mantra sincerely. Among spiritual practitioners it is a well know fact to become happy and healthy in real terms it is important to fulfill self’s need for spiritual nourishment and attention. If we ignore our spiritual health requirements, we become overwhelmed by negative material tendencies like anxiety, hatred, loneliness, prejudice, greed, boredom, envy, and anger. In order to counteract and prevent these subtle infections of the self, we should, as recommended in the Vedic literature, incorporate into our lives a program of self-examination and steady inner growth, based on spiritual strength and clarity of thought. The transcendental potency necessary for developing complete psychological and spiritual fulfillment is already present within everyone. It must, however, be uncovered by a genuine spiritual process. Of all such authentic processes, India’s timeless Vedas tell us that meditation on the Hare Krishna mantra is the most powerful. So by chanting Hare Krishna, one reaps innumerable benefits, culminating in Krishna consciousness and love of God. We can realize the fruits of chanting by adopting the process of mantra meditation and applying it systematically.